The aura supposedly reflects a supernatural energy field or life force that permeates in all things. 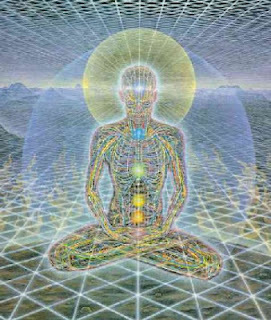 Human auras allegedly emerge from the chakras.The human aura is both an energy field and a reflection of the subtle life energies within the body. These energies make us what we are and in turn, are affected by our surroundings and life style. The aura reflects our health, character, mental activity and emotional state.Commonly called the etheric field, this energy extends about two to four inches around the body and is usually a light or pastel shade. Layering the etheric is the aura which contains every color and shade in the rainbow and usually extends 2- 5 feet from the body. Its colors, textures and patterns reveal much information about physical, emotional, mental and spiritual states. An aura is like a thumbprint; it is completely individual and expresses who you really are in all your splendor. It also shows disease - often long before the onset of symptoms.Under ordinary circumstances, auras are only visible to certain people with special psychic powers. You may use Kirlian photography to capture auras on film. replice of the physical body. The etheric aura is a good guide to the physical health of the person. Then we have Mental and Emotional Aura.We usually think of a body in terms our dense physical one. Seldom do we think without some of emotion, and we react emotionally with some thought entering into the process. These are are refered to as the `emotional body' and the `mental body'. The two aspects of consciousness, emotion and mind, are closely linked together, and the energies of the inner worlds stream through the `bodies' which are our means of contact with those worlds. These energies also radiate out around the physical body, but over a far larger area than the vital energies of the etheric double. These vital energy radiations can usually be a few inches away from the physical body. The emotional-mental auric radiation extends for several feet in the average person, and in more highly developed people it may extend much farther.Another Aura is `spiritual aura', extends beyond the body varies from a few feet, in unevolved people to even miles in the case of highly developed people. great blog.very interesting and useful tips are given. its really works.